On the hottest day of the year – so far – 27 ladies played in the Centenary Cup at Kirkcaldy GC in glorious sunshine. The course was in great condition with plenty of run. We would like to thank the greenkeepers for all their work in the current challenging conditions. All players were well looked after by the bar and catering staff. Our thanks also go to the office and Pro shop staff for their help in preparing for the meeting and on the day. The good weather produced some excellent scoring – at least for some of us !!! Please click here for the Centenary Cup Draw to be held at Kirkcaldy Golf Club on Thursday 26th July. Fife County Member, Midland Vets Champion and new Scottish Senior Ladies' Champion Elaine Moffat (St. Regulus) has been selected for the SVLGA Jamboree Team to play for the Miller Stirling Salver against England North, England Midlands, and England South in the 2018 Jamboree at Hexham GC, Northumberland, on 6th to 8th August. Elaine is joined by Linda Allan (Midland), and Alison Davidson (Midland), Jennifer Bryans (East), Gillian Kyle (West), Frances Millar (North), Liz Stewart (West), and Sheena Wood (North). The current holders of the Salver are England Midlands. Congratulations Elaine on your selection. The Vets Jamboree is a lovely experience and we wish captain Ellie Whyte (North) and her Team the best of luck from all at Fife County Ladies Golfing Association. Fife County’s team member and Junior Convenor, Susan Jackson (Ladybank), will captain the Scottish Girls’ Team of Kirsty Brodie (Strathmore), Hannah Darling (Broomieknowe), Louise Duncan (West Kilbride), Carmen Griffiths (Aboyne), Lorna McClymont (Milngavie) and Jennifer Rankine (Haggs Castle) in the European Girls’ Team Championship at Forsgarden Golf Club, Kungsbacka, near Gothenburg, Sweden, from 10th to 14th July 2018. This will be an exciting trip and we wish Susan and her talented young team the very best of luck. The results from the Commonwealth Spoons Qualifying round at a sunny & warm Scoonie Golf Club on Tuesday 3rd July are below. The 3 couples above qualify for the Commonwealth Spoons Final which will be held at Stirling Golf Club on Monday 3rd September 2018. 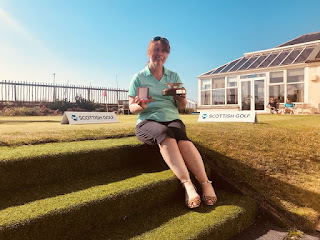 Elaine Moffat (St. Regulus), who won the Midland Vets Championship at Kinross on 19th June completed a wonderful double when she won the 2018 Scottish Senior Ladies' Championship at Prestwick St. Nicholas G.C. on Friday 29th June. As with the Midland Vets Championship, it was the first time Elaine had played in the event. Elaine's performance throughout was classy. She qualified comfortably in tied 5th position after rounds of 76 and 77 and eased past current Senior Internationalist, Gillian Kyle (East Renfrewshire), by a 4&3 margin in the first round of the match play. In the quarter final she disposed of South African visitor, Sonja Bland, by the bigger margin of 5&4 before going on to dominate her semi final match against a tough opponent in former Scottish Champion and Curtis Cup player, Maureen Richmond (Royal Liverpool), emerging victorious by 3&2 and setting up a final against current Senior Internationalist and last year's runner-up Sheena Wood (Aberdeen Ladies).Elaine got off to a great start in the final with an eagle at the 4th hole and was two up after seven holes. Sheena fought back and not only eliminated the two hole gap but went ahead with a birdie at the 12th.Elaine's reputation as a great match player has been earned over many years and it was no surprise when she responded to the challenge with her own birdie at the next hole. A bogey by Sheena at the 14th followed by another birdie by Elaine at the 15th restored her two hole lead and although Sheena cut that to one with a brave birdie at the 17th, a safe par 3 at the 18th was enough to give Elaine victory and the Championship title by 2 holes.